Co. Donegal: Ballintra, Ballyshannon (4), Bundoran (3). Co. Leitrim Glenade (2), Kinlough (2). Co. Fermanagh: Belleek, Boho, Church Hill, Devenish, Innismac Saint (2). The Board also included 6 ex officio Guardians, making a total of 24. The Guardians met each week on Saturday. The population falling within the Union at the 1831 census had been 40,780 with divisions ranging in size from Bellek (population 2,072) to Ballyshannon itself (8,925). 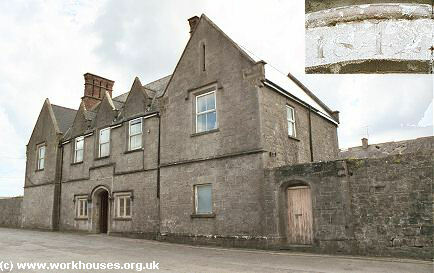 The new workhouse, built in 1841-2, was designed by George Wilkinson. 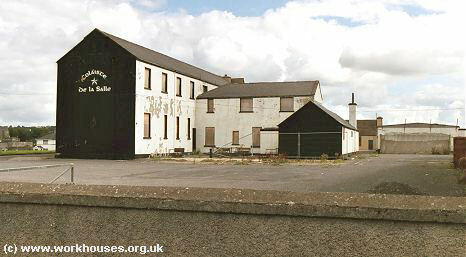 It occupied a five-acre site to the south of Ballyshannon and could accommodate 600 inmates. The cost of the building was £5,850 plus £1,100 for fixtures and fittings etc. It was declared fit for the admission of paupers on 1st October 1842, and admitted its first inmates seven months later on 6th May 1843. The site location and layout are shown on the 1907 map below. The buildings followed Wilkinson's typical layout. An entrance and administrative block at the north of the site contained a porter's room and waiting room at the centre with the Guardians' board room on the first floor above. The date of 1842 is carved above the entrance doorway. The main accommodation block had the Master's quarters at the centre, with male and female wings to each side. Ventilation towers in the roof of the main block were placed over the well-holes of internal staircases to improve the circulation of air through the building. 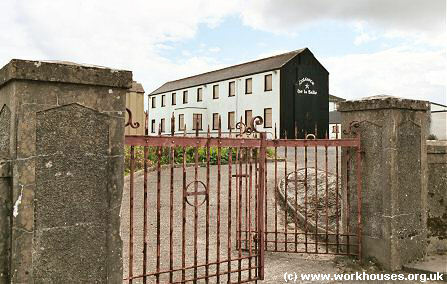 During the famine in the mid-1840s, sheds were erected to accommodate additional inmates. A fever hospital was erected across the road at the east of the workhouse. In 1895, Ballyshannon was visited by a "commission" from the British Medical Journal investigating conditions in Irish workhouse infirmaries. Unlike many of the other establishments inspected, Ballyshannon received a glowing report. All the inmates slept in beds, no pauper nurses were employed, and there was an obvious concern for the comfort of the sick and infirm. All of this was attributed to the efforts of matron and nursing staff, all of whom were nuns. Further details are available in the full report. At the 1901 census, the population of the Union was 20,671 with 9 officials and 123 inmates in the workhouse. 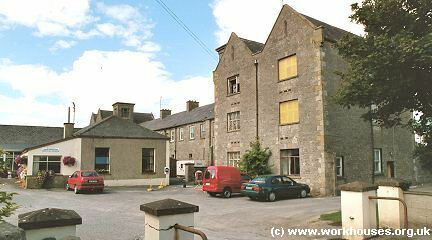 In October 1921, the workhouse was occupied by the Irish Republican Army. The existing inmates were transferred to the workhouse infirmary. The entrance and main blocks are now (2003) used as a council depot. The infirmary block and dining-hall/chapel house an elderly care centre. 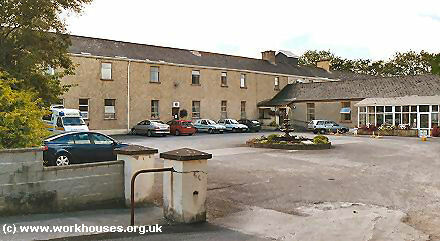 Donegal County Record Office, Three Rivers Centre, Lifford, County Donegal. Holdings include: Guardians minutes (1840-1923); Rough minutes (1840-1841); Abstracts of Union accounts (1843-1872); Union Statistics (1844-1873); Union Medical material (1840-1923); Workhouse specification (1897); Indoor Relief Register (1906-1915); Admission and discharges (Nov 1914-Sep 1918); etc.